Higher Education institutions face many unique challenges when it comes to IT support. Support staff—oftentimes students—may change from year to year, or even semester to semester. The same certainly applies to those on the receiving end of support: the end-users. How do these organizations handle multiple transitions? Learn about the critical role support software plays in higher education IT support and how SolarWinds® Web Help Desk® software answers these questions. Your Higher Education Support Center On Course: Facing the Unique Challenges of Higher Education.” My name is Josh Berman, Product Marketing Manager for SolarWinds Security and Tools Products. I wanted to start off this session with a quick comment that I think encapsulates the focus of our talk today. I recently reviewed the results of the Campus Community Computing Projects 2016 Survey, in which they focus on technology, computing, and eLearning in higher education. One of the primary takeaways of the survey identified several key, high-key priorities for education institutions over the next two to three years. They included hiring and retaining qualified IT staff, assisting faculty in IT instructional integration, upgrading and enhancing network and data security, providing adequate end-user support services, and leveraging IT resources to support student success. For most, I'm sure none of this seems overwhelmingly out of place, but worth mentioning is the focus on providing end-user support. Higher education institutions in particular face numerous challenges with this regard. And ultimately, that mission is evolving. Before we allow our special guest speaker to address some of the subjects, I'd like to cover a few housekeeping items. We'd like to keep this webinar session to as close to 50 minutes as possible. Although we have planned for a Q&A session at the end of the presentation, I encourage you to submit your questions via the Q&A box as they come about. If able, we'll issue a reply online, and if time permits, we'll address them verbally in our Q&A session at the end of the talk today. So, you all know me by now. But I'd like to take a moment to introduce Alex Carroll. Alex is an iTEL and SolarWinds certified professional sales engineer. He draws on experience, or years of experience, assisting customers with finding the right Help Desk solutions, which has helped many businesses improve their internal processes and workloads. He's super knowledgeable about the challenges, the subset of the entire IT department faces, and the importance of this particular role. So, we're glad to have him on this talk. Alex, thanks for joining us. So, our special guest, as many of you might have seen in some of the ads promoting this event, is Roy Atkinson. So, Roy's a senior analyst with HDI. And he acts as an in-house subject matter expert and chief writer for SupportWorld, the blog that HDI runs. His background is in both service desk and desktop support, as well as small business consulting. He holds a master's certificate in Advanced Management Strategy from Tulane University's Freeman School of Business. And he's a certified HDI support center manager. Roy, thanks for joining us for the talk today. And Roy, I know that you've been coming to different events. Recently, you had participated in the HDI annual conference, and also participated in another conference very recently. So, Roy, if you can hear us on the line there, I wanted to know what's next on the agenda for you? What do you have coming up? Actually, in about a month, we'll be having our higher education forum for HDI, which is going to take place at Union College in Schenectady, New York, and I'll be participating in that. We'll be talking to about 30 higher education leaders there, folks from IT, and specifically IT support. And then in the fall coming up— in higher education world, anyway— in the fall, in October, I'll be speaking at the ACM SIGOPS conference in Seattle. In early October, I think it's the first through the fourth of October. So, that'll be interesting and fun. And we'll be talking about higher education issues there, as well. That's great. Well, thanks for giving us that rundown on what's going on on your schedule. I'd like to take a moment real quick to address the agenda of today's talk, before I pass things back over to you, Roy. So, as alluded to earlier, something you all can relate to out there, are the challenges being faced by those serving in the IT support role, and generally in the help desk setting. However, what we'll cover today are those that are uniquely inherent in the higher ed space. We'll discuss two defining elements of providing adequate end-user support services like I mentioned before, and the recipients thereof. Then we'll highlight the evolving nature of the challenge, and how those business units can manage that change that I also mentioned before. From there, we'll discuss some of the basic elements they must consider bringing to light the need for help desk software to make it all possible. Covering some of the key elements of such solutions to save time, money, resources, and overcome all of the challenges higher ed institutions face, semester in and out. Concluding the session, we'll provide a brief intro into one such solution, the web-based ticketing and IT asset management software that we offer, SolarWinds Web Help Desk. After which, we'll open the floor to Q&A session, like I mentioned before. So, I'd like to go ahead and pass things over to you, Roy. I'm going to pass the puck to you, and let you take it from here. Great, thank you so much. Great to be here today and talking with this audience that faces some unique challenges, and that's really what we're going to talk about. Some of you might be new to this role. You might be a new lead or a new manager in a higher education support center, and it's really important for you to think about some of the unique challenges that you face in this role. One of the things that's unique about education in general is that you have this annual onboarding challenge to get. All the folks I know in higher education get slammed when the students arrive. Everything has to be in place. Everything has to be ready for them. And then once they get there, of course, there's going to be bumps in the road, and they may have devices that you're not fully prepared to support. They may have more devices than you expected, which is very much the case these days. So, they arrive within a very short period of time, and they have all kinds of different devices that you have to support. Going back not that many years, I think 10 years ago, you did not have so many mobile devices, you didn't have the gaming devices that we have now, all these things that students are bringing onto the campus and expecting to be on your network. So, you have to provide resources for them to succeed. And you have to be able to support all of those different things. Most of the higher education institutions that I speak with generally will support pretty much anything that comes onto the campus. And that may be the case with you or perhaps you have some limitations on what you will support. But an awful lot of colleges and universities provide support for anything a student brings onto the campus. They'll make sure it's able to connect to the network and be functional. Now, another side of that challenge is that many of you have student work-study program people actually providing support at your desk. Which again, because they're going through a four-year cycle of education, means that 25% of so of them are going to drop off every year. You might have new people coming in, you might have more people dropping off, whatever it happens to be, but it's roughly about twice the industry average, which is 13%. So, just by the nature of the beast, it's about 25% and that's twice the average across the industry. So, you have much higher turnover than most industries. And what that means is that you have unique challenges in terms of knowledge management, and just providing continuity of support from year to year can be a challenge. Because you've got all these new people coming in. You have to depend on your permanent staff if you have one, and we'll talk a little bit more about that, or your experienced student support people to pass on what they know, and how they've done things. And there has to be some process and regularity about that, hopefully, from year to year. So, unique challenges and more power to you for taking them on. So, two worlds of higher ed support. One is that the regular ongoing work that you do to make sure that the campus is running properly, and the infrastructure's in place, and upgraded and patched, and all of those things that has to happen in any institution. And then supporting your relationships with the people who are there all the time, which is the staff and faculty, generally. All your administrative people, all of your faculty and teaching assistants and everybody else that works to deliver information to the students. And then you have the year-to-year challenge, as I mentioned earlier, you have all these students coming onto the campus, and changing devices systems software. You're seeing a lot of cutting-edge stuff, obviously, when you have younger constituents coming in to the campus. They're going to want the latest and greatest devices. So, you're going to be bringing things on that a lot of organizations in the business world would probably not consider supporting them until after a period of time. Sometimes it takes two years, sometimes even more, before a device will become a standard supported device in a business. You don't have that luxury of time. You've got to support it and you've got to support it now. And also, the communication methods that students have are going to be a little bit different from business folks. Probably less likely to pick up the phone, more likely to send you a text, or send you a message over social media. So, you've got to make sure that you're monitoring the right channels, and you are paying attention to how the students communicate with each other and with you. And you've got to be able to absorb that information, and get it into your systems so that you can deal with it later on. So, there's lots and lots and lots going on every single year, and like I said before, I applaud taking on the challenge. It's just absolutely amazing when I watch some of the higher education support professionals deal with this every year. It's really incredible how much work happens. And I know from my own experience working at an institution that used to offer education programs for a short period of time every summer. Students came from all over the world for that particular course, and I know all the work that we had to do gearing up to make sure that all the equipment, and network connections, and software, and everything was in place that those students needed when they came in every year and got those courses delivered. So, this is a much bigger challenge for you. So, congratulations for taking that on. So, you've got three major constituencies. In most organizations, you've got what iTEL refers to as customers and users, right? You've got the people who actually sign the service level agreements; those are the customers by iTEL's definition. Which I don't completely agree, by the way, but that's for another time. And then you have users, who are the people who receive the services that you offer. But you've got three distinct groups. You've got your faculty; they're going to have certain computing needs. They're going to have some challenges in terms of things like audio visual, and the software that they use to deliver their particular courses. And then you've got the staff, who are basically business administrative type people, who are using probably, more or less, standard hardware. And then you got the students, who have one foot in both places. They're in the classes, they're in the residences, they're wherever they need to be with whatever devices they want to be. So, each of these has unique technology needs, and you have to support all of them. So, you've got to use your scope of support. And you may not be able to provide support for everything the students have. Like I mentioned earlier, a lot of organizations do say that we'll support anything you come out of campus with. But some of them may offer limited support for certain types of devices. You may even want to support for faculty and students in terms of such devices or particular equipment that they may want to use. There's a wide variation across the field. So, we have to be aware of all of those challenges. So, how do you deal with all of that? You've got people challenges. You've got technology challenges. You've got knowledge challenges. How do you deal with all of that? How much time does it take to get your new student workers up to speed every year? In the industry, we call that time to proficiency. And how do you deliver knowledge to those people to get them ramped up in time for them to be proficient when the students, staff, and faculty need them? And some of that comes from working with more experienced people or permanent staff members. Some of it comes from getting the knowledge from the tools that you're using. And we'll talk a little more about that. And then there's just dealing with the tools themselves. Now, a lot of these people may not, in fact, have any background in delivering support, probably don't, except maybe helping their parents or grandparents deal with their issues getting on the home network and connecting their iPad or whatever. But if the tools are complicated for them to work with, if it requires a lot of work for them just to be able to use them, then that adds to the burden that you have of delivering that knowledge on top of the troubleshooting and support knowledge of your systems. They also have to learn the tools. So, you're adding a particular, an extra burden. So, how do you share knowledge, and how do you guide new team members? It's so important to be able to pass things along. And remember that somebody new is starting every year. And as I mentioned earlier, and you know this, about 25% of your support staff, your student staff, is going to change, and that's very different from the industry. So, it is a much more important challenge to be able to deliver information to help guide your support people through the steps that they need to take to troubleshoot and resolve particular issues or to make sure that somebody gets a service that they're requesting. So, simplicity is key and knowledge transfer is absolutely key. Super important to be able to give that information. So, just from a simplicity standpoint, how do your team members learn to document the contacts they have? Most of us, if we're coming from a high school environment onto a campus environment, or even between years, and we're starting a new role in support here, we're not used to documenting every phone call we have. We're not used to taking down the details. We're not used to that kind of thing. Even if we do a lot of troubleshooting in our family and so forth before we come to this role, we're not used to documenting stuff that way. And I used to have a sign outside my office at the Jackson Laboratory that said, "If it's not documented, it's a rumor." It's really important to document everything that you have. Even if it's a wrong number to the support. Even if somebody dials the wrong number on the phone. They're looking for a pizza delivery and they call you instead, it's important to note that. Why? Because well, maybe it turns out your phone number in support is one digit away from one of the pizza delivery places in town, then you should really change the phone number. Yeah, I made that just kind of a silly example, but I've seen it happen. So, document everything. How do you learn to categorize? That's one of the most difficult things to do. When something comes in, how do you properly categorize it? And then beyond that, even prioritize it, but let's stick with categorizing it. Is it a hardware issue? Is it a software issue? Does it have to do with a particular system and application? Almasa learning system delivery problem. What exactly is going on? And teaching people that is difficult, and giving them the opportunity to easily choose the right category is really important. What tends to happen if you don't have the ease of use for categories, is that everything winds up in another bucket. And what happens when it winds up in another bucket, is that it doesn't give you, as a manager or lead, any information about really what's going on. It makes it extremely difficult for you to get the metrics that you need every month, or quarter, to see what your top issues are, what's failing in terms of infrastructure, what's working well. It makes it extremely difficult. So, you want to have the issues and tickets, as we refer to them, properly categorized and make sure that people understand where they're supposed to direct their energies. Impact and urgency. If you don't think about it— Impact and urgency vary hugely from person to person, even for the same exact issue. So, let's say I can't print from my desk. Well, big deal, I print very little. What I usually print is just so I have a hard copy. Maybe I need to fax something somewhere for some legal requirement for one of the things that HDI does, or whatever it happens to be. But if I think back to when I was working at a laboratory that was applying for multimillion-dollar grants from the National Institution of Health every year, and I think about a scientist needing to print information out to fulfill the requirements for that. Now, you're talking about a piece of paper that might be worth 10, 12, 14, 16 million dollars. Is it important that that person is able to print right now on the day of the grant deadline? You betcha. So, impact and urgency can have huge variations, even for exactly the same thing. So, how do you teach that to the person who's sitting at the desk? It's not an easy task. I salute you for taking this all on. And again, it's documentation and it's ease of use in your tool that's really important so they can look at what has happened with this particular person in the past. They can look back at records. Or they are prompted as they type in, perhaps some things pop up that will ultimately improve some of the things that they have to do. How do you troubleshoot a device you've never worked with before? You might not even know what it is. And again, if your campus supports all the devices that students bring in, then you've got that issue. I've never seen a whigamacallit, and somebody's calling about one because they can't get it on the network. I don't know how to walk them through the steps to even find out what even the network settings on this thing. And then how do you properly resolve an issue once you have solved it? A lot of times, people will jump the gun a little bit, and say an issue is resolved when, in fact, it isn't. And just remember that it's not resolved until the user or customer says it's resolved. Yes, now it's working, I can get on the network, I can see the things I need to see. I can transfer this information. I can do whatever I need to do to get this work done. Very important stuff. All right, so, from my perspectives—and I'll look at this in a little bit more depth, of course. Some of the characteristics of a higher ed support tool. It has to be easy to learn and use for reasons I've just discussed. You've got to be able to transfer this knowledge as easily as possible when your new people show up and ready to go to work in September or August, whenever your school year starts. You've got to be able to get them up and running quickly and easily, and have them understand what they're looking at when they look at the screen, and be able to find the elements that they are going to use quickly and easily. It has to be, from your perspective, easy to manage. You have to be able to add people to it, and take people out of it easily because you're going to have that staff turnover. You're going to have a changing environment as you upgrade your infrastructure. You've got to be able to manage that tool, and get information into it and out of it very easily. Hopefully, you've got a tool that is going to offer knowledge suggestions as I just mentioned on the previous slide. A lot of times, it is extraordinarily useful as someone who may not be totally fluent with a particular tool that someone's calling about, a particular type of device, or a particular piece of software, offering knowledge suggestions to them is extremely valuable. Having that built into your tool is extremely useful. Not too complex, but it's got to be complex enough. It has to be able to handle all of the things that are going on, at the same time, presenting a simple user interface that's easy to use for people to transfer knowledge about. It's got to be flexible; we've talked about this. Again, as a continuing theme, where our large changes year to year, and probably much larger changes than you'll find in any other area of business, unless you're in a startup or something like that. But in the campus environment, things are going to change much more rapidly than they do out in the world of business. And it has to be secure for reasons we explained. You've got to prevent people from having personal information stolen. You've got to make sure that your network infrastructure is protected from a security standpoint. And that you are not opening up your campus to liability, or theft, or whatever, because these things are ongoing attacks, and penetrations, and you have to pay attention to security. So, here's the basic components from a very high-level view. From 50,000 feet, we look at the things that are necessary to have in a tool. You've got to be able to handle a directory of some kind. You have to know who your users are. And you have to be able to control them. So, whether it's active directory that your campus uses, or whether it's LDAP directory, if it's homegrown, whatever it happens to be, you have to be able to use that and pull information from it. You've got to be able to handle incidents and service requests. Of course, the two main things that you're going to be doing, you want to be able to differentiate between them. You want to be able to pull metrics on each one of them. By the way, just to reinforce your existing knowledge, I'm sure, the difference between incident and a service request. I always think of it this way, it's very simple. An incident is clean up on aisle four, right? Somebody dropped a jar of beets that broke. And a service request is, there's somebody in aisle four who can't reach the top shelf and needs some assistance getting one of the things off the shelf. So, it's a service or it's something got broken. And just remember that incidents are really IT in general bits, IT's report card. If things are breaking a lot, then you have problems in your IT that you need to address. You've got network issues, or you've got data center issues, whatever it happens to be. And make sure that you pay attention between incidents and service requests. Okay, another element that's extremely important for certain areas of the support group in your organization. The most important tool, or the most important component that you're going to have is remote support. It used to be that, and I'm not talking a lot of years ago, I'm talking a few years ago, that generally speaking, an incident let's say, would be reported to the service desk, and it would be passed over to desktop support group, and somebody would actually go out to the desk side and do whatever they needed to do. So, of course, sometimes that still happens because people lose network connectivity or whatever. Remote support right now is done equally, about 81% of the time it's the service desk, and 81% of the time it's desktop support group, if you differentiate between those two groups. So, everybody uses remote support. It's in use in over 80% of support centers with another 9% planning to add it in the next year. So, just about everybody uses remote support of some kind. And it's exceedingly important, because it gives you the ability to not only to fix things on the fly, but also to explain things as you do it, which is a really good thing to do, so you're educating at the same time. Having a knowledge base at least of some kind. And again, if it's not documented, it's a rumor. If you don't have a knowledge base, and you don't teach people to use that knowledge base to understand what's being prompted as they're working, and how to search it, and how to understand what's in there, and make sure that it's up to date, then you're recreating every troubleshooting step as you go. And there's no need for that. It would be as if nothing had happened past the Wright Brothers. When you went to the airport, if the pilot had to figure out what aerodynamics were, and the wind direction, and how to get the plane launched in order to get off the ground every single time, imagine how much work that would be. But you don't have that much work because the knowledge is stored, planes are built properly, things are automated, and we move on. The pilot gets in the plane, goes through a checklist. By the way, very important that they go through a checklist making sure that they have knowledge of that switch being in the correct position, et cetera, and then they take off. We don't have to relearn how to fly every time we need to get in a plane. And it really is something very similar to that when somebody has to walk through all the steps required in order to troubleshoot a particular piece of hardware or software. And the other thing is, now you've got those three main constituencies. You've got faculty, staff, and students on your campus. They are using different sets of assets, different sets of software licenses, different sets of hardware, even from the time that they maybe leave their dorm with their laptop under their arm, and then they go into a class that has a computer lab involved, and they use campus-owned hardware. So, asset tracking, and asset recovery, and asset management is extremely important for both hardware and software. That's another component. And then there's the mobile phone. Of course, everybody's mobile now, especially folks that are of college age. It's very, very important to have mobile capabilities. And interestingly enough, in some research that HDI just recently did, some of it hasn't been released yet, we found that despite the fact that about half of all service management tools have mobile capability, have the ability to be displayed and track on mobile. About half of organizations don't have that capability because in over 20% of the organizations, they haven't turned it on. Very, very interesting stuff goes on in the world of IT support. Believe me, I can't figure that one out at all. When mobile first became available, that was one of the first things I did and it saved oodles of time for my desktop support teams simply because they were able to update tickets, create tickets on the fly. And having that mobile component is exceedingly important, and even more now. So, I hope we've shed a little bit of light on your world. And just a reminder, as if I had to remind you that your budgets are tight, the tool you choose has to be affordable and it has to be capable. So, all of the things that we talked about, ease of use, knowledge base, administratively easy, having the ability to connect to directories, and manage all the things that we talked about just now, but it has to also fit your constrained budget. Everybody's budget is constrained, certainly in terms of the college and university world, your budgets are constrained. So, make sure that you're looking at tools that will fit that budget. Okay, now I'm going to pass the baton, as it were, back over to SolarWinds, and they're going to talk to you a little bit about their particular product, then we're going to have some questions and answers. Perfect. Thank you, Roy. Hey, everybody, this is Alexander Carroll. Thank you for the time today. I hope to go through the product and kind of show you around what helped us. Thank you, Roy, for that excellent presentation. Moving forward here. A couple of things about Web Help Desk that I wanted to touch on before I start going to the live, interactive demo, and we get to a Q&A session. Some important areas to take a look at. So, what helped us can help out with creating tickets in the environment, really easy to assign tickets to different groups, or root out escalations within the organization or school. We can automatically discover, manage, and report on assets in the environment. So, if you wanted to pull in, as an example, a Windows laptop and see who owns that computer, see kind of the general life cycle of that environment, we can help out with that. We have a heavy focus on end-user self-service. So, people being able to log in to a self-service portal, you know, students, faculty, and staff. Submit service requests, maybe raise an incident ticket, as an example of being able to go through and have that experience. Also, search through a knowledge base that's easily accessible. And then from more of the IT admin perspective, being able to handle change requests in the environment. So, we do have areas in the product that touch on that, help out with workflows. So, we know that there is quite a bit of workflows out there in schools that we can help automate. With built-in reports and dashboards, pretty usable to look around. If I wanted to open up a dashboard, which is unique for each technician, or IT staff, I can go through and look at the data in the environment. See how many tickets are out there, how many are open and closed, as an example. And then just running reports in general, so reports on tickets to make sure we're hitting those ticket escalates, assets in the environment, how do we go about doing that? So, what I'm going to do right now is hop right into just an interactive product demonstration here. And we'll show off some of these key features. So, this perspective that we're taking a look at here, this is the end-user or client perspective. Maybe a student would go in here to submit a service request, as an example. They can go through, pick a request type, or often referred to as a category in some systems. These request types are highly customizable through the application, so there's no need to open up a back-end code or something like that to make one of these request types. Now, what's nice is if I'm going through and I'm trying to submit a ticket, I have an option here to say, "Okay, this is an IT request." And you'll notice on the right-hand side, since I'm selecting an IT request, there's a related FAQ portion that'll pop up inline to what I'm attempting to select. In this related FAQ portion is one of the first areas in the product that we see the knowledge base. So, we do like putting this in the self-service portal. The user does empower that end-user to maybe take a look at their issue. There might be a question in here that's exactly what they're about to submit to the IT team, and they can help themselves out. After I select a different request type here, I kind of go down the chain, maybe IT request, and specifying it's a network support ticket. That'll reformat that related FAQ, which is on the right-hand side to something that's a bit more specific to maybe the question or category that I'm asking about. Some other areas in the self-service portal what is nice. So, if we take a look here, we do have an option to say there's a subject and request detail for a ticket. And that can be pretty generic, pretty general. We might need to get additional forms in this system to start a workflow, so we can customize that based off the request type. So, you can have a built-in instruction sheet right here. You can have just a free text field checkboxes, radio dials, drop-down menus, whatever you'd like to see in the product. Again, that's pretty easy to customize through the application. You can also, at the very bottom, select an asset that you're submitting the ticket about. So, if I'm submitting a ticket, use Roy's example, maybe I dropped the beets, right, in aisle. If I wanted to say my computer's broken, and I want to specify that this is my system that I'm trying to submit a ticket over. I can easily do so down here. In this self-service portal, there's also a history section. So, if I wanted to go through and just verify that a ticket that I submitted is being worked on, I can see who's working on the ticket, when it was opened, when it's estimated to be completed. I can also go through in this section and add a note. So, if I wanted to communicate back to the technician who's working on my ticket, I can easily do so, or cancel my ticket. So, a couple of options here. Now, to Roy's point, being mobile's important and this can all be handled through a phone. So, if I wanted to do this through email, I can get an email notification as an end-user submitting a ticket that work is being done on it. I can update my ticket through email, a couple of options there. There, of course, is an option in the self-service portal to just touch on that knowledge base. So, if I wanted to go right into the FAQ section and look through the knowledge base, search the base off the key words, I can do that. Pull up articles so I don't have to see it in that wish view when I'm submitting the ticket. This is a way to just view the knowledge base by itself right here. And then a message board for the technicians to talk back to the end-user. So, if there's an important message that needs to be communicated out, the technician can post that up in the self-service portal for somebody to view. Switching perspectives just a little bit right here. This is for—again, this was for the end-users or the clients in the product who are trying to submit a ticket to students, faculty, staff. This perspective is more for that IT pro right here. So, if I go into this side of the product, the format's going to change just a little bit. There's some important pieces to touch on here. There is a dashboard that's unique for each technician. So, if I wanted to go through and look at different areas in my environment, and maybe just kind of high level, show me all the tickets by a certain status in the environment, tickets by a certain priority, tickets by tech groups that I'm a part of, or by location, there's ways to sort that out. here's also a couple of ticketing queues up here, so if I wanted to look at the tickets that I'm assigned to work as a login technician, I could look under the ‘my tickets sublink,’ or the tickets for the tech groups that I'm a part of. And it's very easy to set up these tech groups. So, if you wanted a certain ticket to route to a different group of technicians, very easy to set up with the application. In this ticketing queue, I can open up a new ticket. And as I open up a new ticket, I can easily pull up a student, as an example. So, if I were to type in a name, hit enter, that could pull from something like Active Directory, as an example, show me a couple of pieces of key information about that student. And then also show me ticket history. So, any previous tickets that were submitted, it would give me a bit of a heads ups before I continue in to do that work. There's an asset info tab, and that ticket's unable to select an asset that the ticket is in reference to. Then we do get a little option up here to use a remote tool. One of them being, as an example, being Dameware Remote Support or Dameware Mini Remote Control that SolarWinds sells. And then in the ticket details, this is where I can go through and I can pick the request type, the category that the ticket's in reference to, pick what group it's going to be assigned to. And then I can also specify any details right down here in the notes section. So, if I wanted to communicate back to an end-user, what's nice about this section, I have an option, another example, with the student, say, this note is visible to student or by unchecking this, this is not going to be visible. And then I can create a knowledge base article based off of this response. So, pretty easy to inline create articles for the knowledge base here. And then some other areas of the product that I wanted to show off. There is an option for asset management. So, we can go through and we can say, if I wanted to have a certain record, certain asset in Web Help Desk, we can pull up information about that asset so we can see what end-user's assigned to that asset. So, as far as like maybe a laptop and a student, we can show that. We can also show what the current status is, which is customizable through the application. Any pertinent details on the asset, so things like MAC address, networking, IP address, as an example. Maybe even installed software or something of that nature, we could pull up through this portion. And then we can also show a list of tickets that were associated to that asset. So, kind of important to keep track of how many tickets maybe a certain model of computer opening up to figure out if we need to switch to a different model, as an example. Then, of course, through the tech interface, we do have the same option to view that knowledge base, or the FAQ portion of the product. What's nice about this is when you create a new knowledge base article; you have an option to pick the audience. So, you can have not only articles that are visible to the faculty, staff, and students, but you can have articles that are only visible to the IT pros on your team. So, you can pick the viewing preferences down here. Pretty easy to post these articles up. You can, of course, add an attachment. So, if you want to do see that come across and maybe that front-end ticket submission, very easy to do so. Perfect. Well, Alex, thanks for giving us a quick demo there. Let's switch things back over to the presentation mode here. So, I think at this point, I'd like to go ahead and jump into our Q&A session. Before we do that, folks, I wanted to send out a quick poll to get some answers from you about your interest in learning more about Web Help Desk, in particular. So, while we transition over, I'd like for you to respond to that poll there if you get a sec to do that. Yeah, so I really appreciate, Roy, your time. In particular, in kind of laying out the details surrounding support in the higher ed setting, and the challenges higher ed institutions face. And also you, Alex, for giving us some insight into what Web Help Desk can do. We did get some interesting questions, I think as, Alex, you were kind of moving around within Web Help Desk. Someone had spotted an icon that kind of gave some sort of semblance to being able to launch a remote session to troubleshoot issues. Now, I think it would be helpful to talk about our capabilities around that. So, for anyone that has a desire to act on that, we have a separate product that I'd like to talk about. Sure, so there is a product that we sell called Dameware Mini Remote Control and Dameware Remote Support. 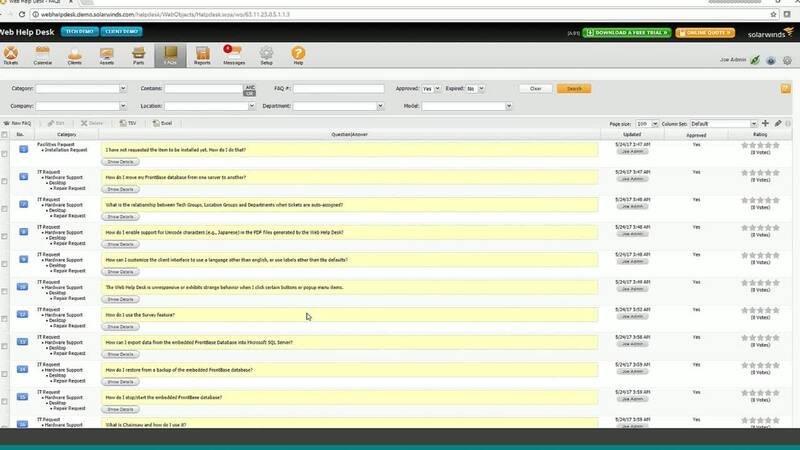 The context of how it integrates with the Help Desk solution. If you have an end-user that calls and they need help, you can open up Web Help Desk. And from that Web Help Desk ticket, you may even be able to see the asset that's assigned to them. There is a portion for you to launch that remote session. And what that would do is it would find Dameware Mini Remote Control that's installed on your system as an IT pro, so laptop or desktop. You would launch that remote session and help the end-user like normal using that product, giving you lots of features in that remote session, a utility so you can open up a chat session. You can do simple file transfer, screen control, lots of great features in that product. After you finish the session in that Dameware tool, you would close that out and that would open up a box that would say Web Help Desk integration option, and you can export back the session details from Dameware into a Web Help Desk ticket. So, it kind of drops almost an audit trail into that Web Help Desk ticket to figure out when you looked into Web Help Desk, when you connected to somebody's remote system, who terminated the connection, any pertinent session details, any chat logs you wanted to attach, any screenshots. Maybe your file attachment you wanted to add from Dameware back into Web Help Desk. So, it's a really great way to keep everything in one spot. That's great. Well, I think it's always nice to know how you can expand other capabilities. I really do feel Web Help Desk has some very robust capabilities. You only touched on a few of them there. And I'm glad that the interest is there to not only learn more, but also provide a deeper level of support with the addition of some other tools that can help out with that. And I just saw a question come in here from one of the attendees, asking about AV equipment being controlled over IP and how would the asset manager track those pieces of equipment? That's a really great question, and kind of how we might approach that. The built-in capability of Web Help Desk gives you a network scan to find assets on that network would be for WMIs. We're looking for Windows laptops, servers, as an example. We can also integrate with some third-party asset management tools. If I were to pull in and try to get assets from SCCM, as an example, or Casper, there's an option for that. There's also an option to tie in to some of our SolarWinds Orion products. So, if you're monitoring that AV equipment, through something like the Network Performance Monitor, as an example, or server and application monitor, a Network Configuration Manager, we can pull node information from those tools. We can also just talk to a database directly. So, if there's a database that contains the information for that AV equipment, whether it's SQL, MySQL, there's a couple of database types that we support. We can map that directly back into Web Help Desk. So, there's a lot of ways that we can pull assets in besides just uploading a spreadsheet, as well. That's great, I'm glad that you mentioned that, too, because that's something that a lot of our SolarWinds customers take advantage of if they're using some of those products that are on the Orion Platform. They're actually able to have alerts that are triggered in those different uses of software, come back to Web Help Desk so they can start acting on the issues that they're being faced with immediately, and avoid the flood of support requests that might come in as a result. I think that we're running a little bit short on time, and my promise to try to keep this to about 50 minutes as possible. I think one last thing that I wanted to mention was regarding the licensing structure for Web Help Desk. In fact, this applies to Dameware, as well, since we mentioned it before. But these products are sold on PRIM. They're offered as perpetual licenses, meaning that you buy the product today and you own it in perpetuity. And with that purchase comes one year of free maintenance, and 24/7 support for the first year of ownership from the moment of purchase. So, that's a huge benefit to people. We see a lot of our competitors out there that are offering on SaaS-based models, so what that means there's monthly payments. But this is a one-time and then you're done. And then whether you want to continue with maintenance, which like I mentioned before, includes that 24/7 support, and the ability to upgrade to the latest version of the product with each new release. They just have to renew that maintenance year over year. So, as is, incredibly affordable product, high functionality, and so, couldn't speak more highly of it. So, I think that just about wraps things up. I do want to thank Roy again. Thank you for your time today in helping to educate us on some of these matters. And thank you again, Alex, for your time, as well. Folks, we'll hang out on the chat session a little bit longer if you have any other questions you want to pop into the Q&A box, and we'll be happy to address those over the course of time until you're ready to hop off the line. But thank you all again for your time. And I hope to see you at one of our future events. Thank you.